theme Archives - The Qlik Fix! The Qlik Fix! At Bitmetric, my colleagues and I regularly meet after work to investigate and experiment with interesting methods and technologies, share knowledge and generally shoot the breeze (we’re all at different client sites during the week, so it’s a good time to catch up). The topic of our last meetup was Qlik Sense Themes. 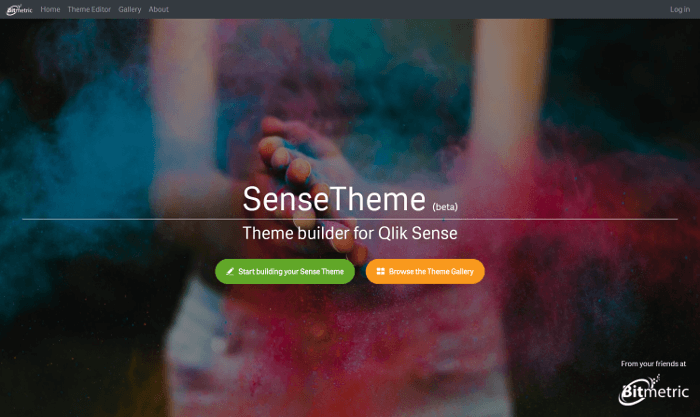 This is one of the big new (and highly anticipated) features in the Qlik Sense February 2018 release, allowing you to create custom themes for your apps. Our expectation was that we’d get the general idea of themes, go over the syntax and build a few cool themes. In reality, our meetup quickly devolved into a hunt for missing curly braces, property names and CSS classes. Still fun, if you’re into that sort of thing, but not as productive as we’d hoped. "This has been a fantastic experience and the learning opportunities were enormous. Of all the training and conferences I attended for QlikView this has been above and beyond the best one to date." "When you finish the developer course you think you know it all, but when you come to this Summit you realize that you know nothing. It was much more than I expected." "“Great presentations, very energizing and inspiring. Lots of tips and tricks, ideas and experience exchange." Want to learn QlikView at your own pace? Get the book! Are you a consultant, partner or trainer and do you want to deliver QlikView training in a classroom setting? Materials to turn the book into a full classroom training are available.